Skeleton of human body bears entire weight of skin, organs and muscles. When body moves, it moves due to functioning of joints and muscles; even while sitting or lying, the weight of body is over bone skeleton. Due to aging or lack of nourishment, muscles and bones can stress-out and cause pain during movement. The kind of pressure these organs bear throughout one’s lifetime makes them prone to damages. Proper nourishment, exercises and care can protect these organs and make them work without any trouble for longer period in life. The question is how to protect muscles and bones from stress and make them work smoothly, and also how to relieve already existing pain and stiffness? The answer to this question lies in exercises, supportive diet, healthy lifestyle and use of herbal treatment for joint and muscle pain. Herbal supplements work as highly effective treatments and provide quick and natural relief for joint and muscle pain. Bones need regular supply of calcium and other minerals to maintain strength and flexibility. If bones are deprived of these minerals or are unable to absorb them, these become brittle and weak. Weak bones are unable to maintain joint movement and cause pain during movement and even in a resting position. Muscles are attached to bones and make them move. If muscles do not get optimum supply of energy and regular nourishment, these too become weak and lethargic. Weak and exhausted muscles are prone to suffer sprains and pulls which can make them swell. Sprained or stretched muscle causes pain during movement and if injured, muscle attached to any joint even can cause joint pain. Herbal treatment for joint and muscle pain is highly effective and provides quick relief. Due to their ability to strengthen bones and joints of the body, these work as natural relief for joint and muscle pain. Joints are formed where two bones meet. The ends of these bones are covered with cartilages so that these bones do not rub each other during movement. The bones forming a joint are placed a little away from each other and these are held at right place by ligaments. Entire joint is covered in a capsule which is full of synovial fluid. This synovial fluid keeps cartilages moist and flexible and also protects them from damages. Joints are strong but these are prone to wear and tear as these bear entire weight of the body during movement or while performing any other activity. Sometimes while playing or accidentally person puts excess pressure on a joint which can cause damage to the joint mechanism. Any injury to ligaments, muscles, cartilages or infection in synovial fluid can result in severe joint pain during movement and stiffness. Herbal treatment for joint and muscle pain works as highly effective natural relief for joint and muscle pain. Rumacure capsules are the most effective and dependable herbal treatment for joint and muscle pain. 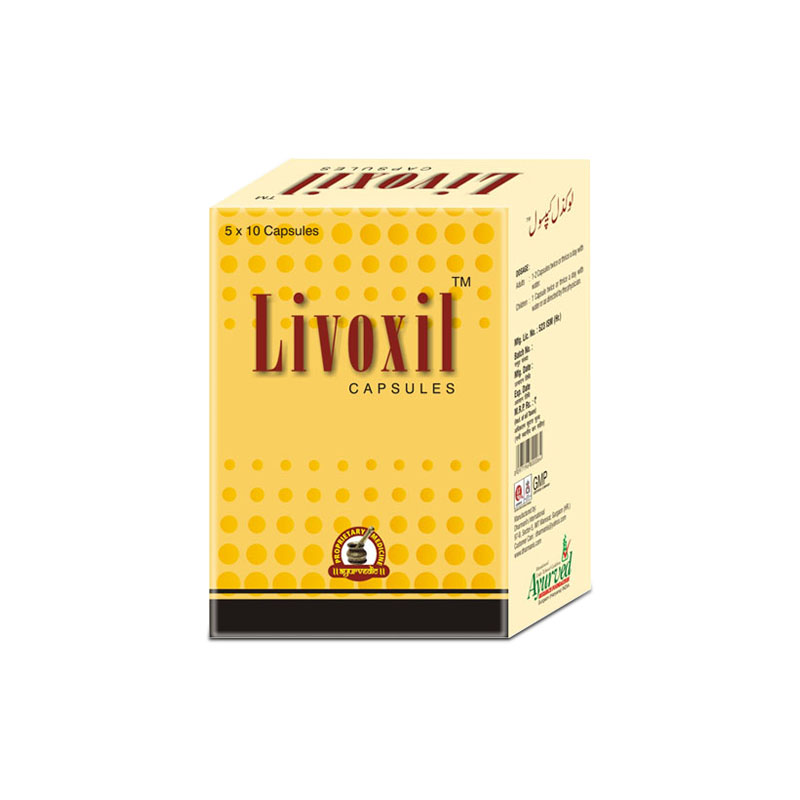 These are purely herbal preparations and work as natural relief for joint and muscle pain. 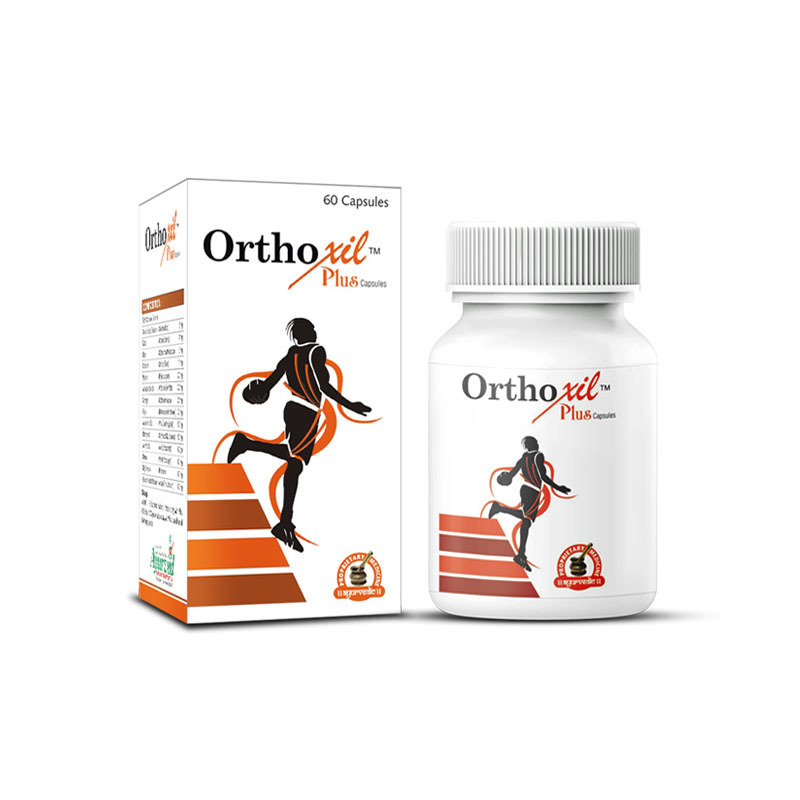 These capsules not only relieve existing pain and swelling in muscles and joints but also strengthens them to prevent any problem in future. Regular use of these capsules provides longevity to muscular endurance and joint strength. The capsules cure and supplement to improve functioning and endurance of entire musculoskeletal system. 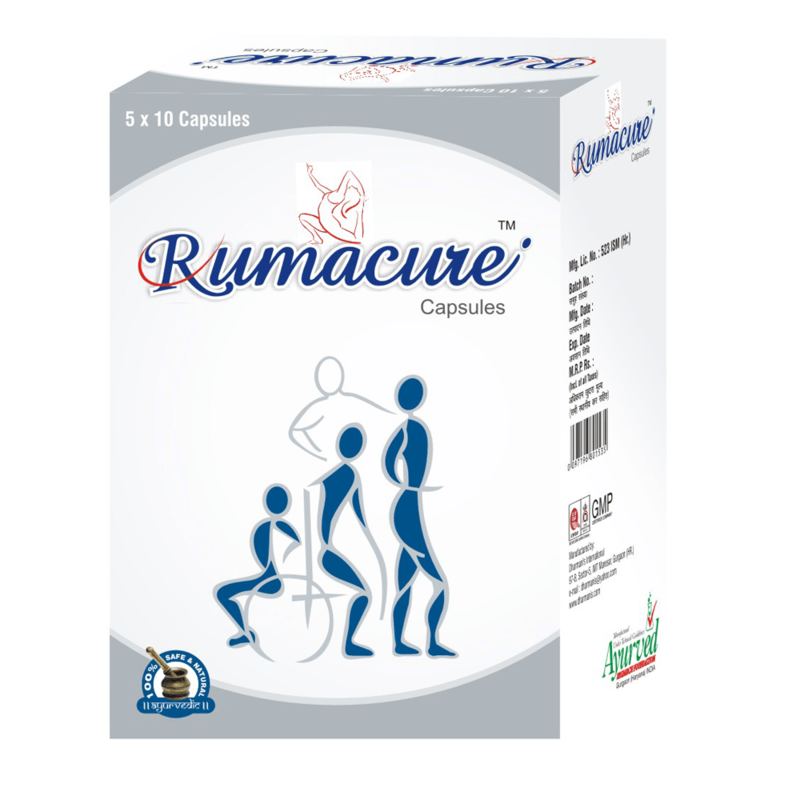 Rumacure capsules come loaded with renowned and extremely effective herbs as ingredients. These are Asthisanhar, Chobchini, Long, Rigni, Guggul, Jaiphal, Ashwagandha, NIrgundi, Ghavpatta, Nagkesar, Piplamul, Haritaki, Rasna, Nagbhasma, Ramayphal and Godanti Hadtal Bhasma. All of these herbs are blended with a formula which makes them highly effective in providing nourishment and curative effects to bones and muscles. These herbs supplement vital nutrients to the body in bio-available form. These improve production of bone tissue to improve bone strength and flexibility and also increase nourishment to muscles. With strong and healthier bones and powerful muscles, entire musculoskeletal system works smoothly for longer period in life. These herbs relieve pain, swelling and heal wear and tear of muscle tissues quickly. These herbs also help in keeping cartilages healthy and also repair damaged cartilages to cure restricted movement of joints and joint stiffness. Rumacure capsule supplements vital minerals and vitamins to strengthen bones and make muscles strong. These improve blood flow which supplies nourishment to muscles and bones and make them enduring. 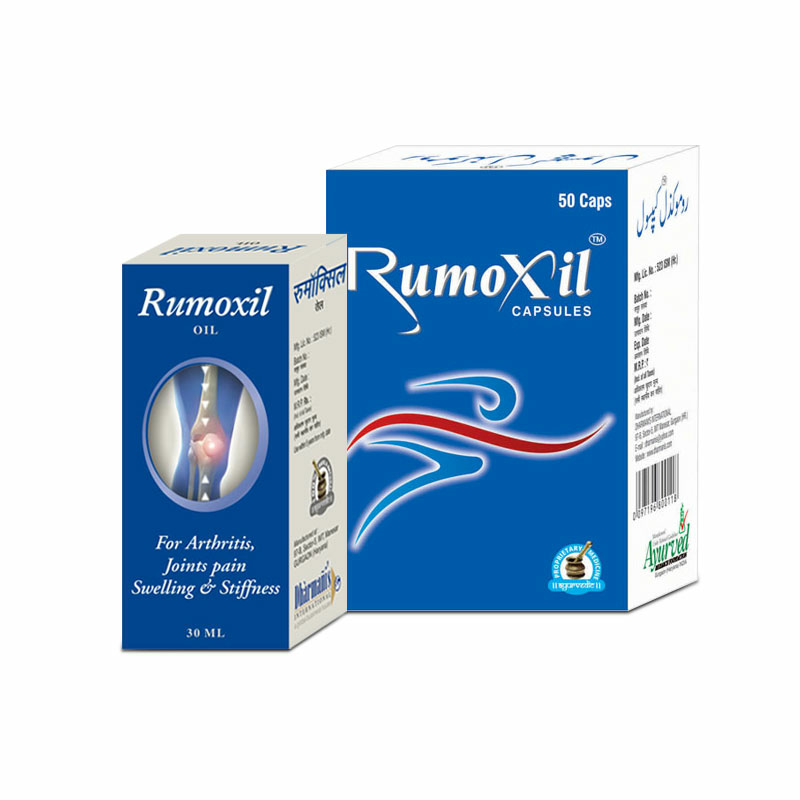 All these benefits provided by Rumacure capsules make them highly effective herbal treatment for joint and muscle pain. Their abilities to eradicate cause of problem make them work as natural relief for joint and muscle pain. Since these pills are purely herbal in nature, hence can be taken by person of any age and men and women both get benefited alike. These are extremely useful for elderly people as these can relieve symptoms of Arthritis too and promote painless movements. Take one or two Rumacure capsules twice a day with water regularly for about 3 to 4 months to get long lasting relief from stiff and painful joints naturally. I had a fracture 4 months ago and after that I never recovered from its pain but when I started taking Rumacure capsules my pain started vanishing. I am glad that I trusted these. It has done what it usually claims. Both of my parents are above 70 years of age. They have the problem of osteoarthritis. This is why I ordered these capsules for them. They are recovering from this slowly. Since they are old their problem obviously won’t completely vanish but they are highly relieved and are now able to perform basic work of sitting, standing, walking, etc. I have now ordered Rumacure oil for them. I love them smiling. Thanks a ton people! Great job! These capsules are great if you are regular with the course. Their daily intake curbs the problem much. I suffered from muscles and joint pain for quite a long time before I started using this product. Suggested by a friend’s father, I could not have been more pain-free and comfortable. It does really give you long-lasting effect.